The Beast from the East and Storm Emma have provided right-wing politicians and the mainstream media with a badly needed opportunity to promote domestic water charges, again. This time, however, they have to resort to fake news because we now have evidence to contradict every single aspect of their claims. That won’t stop them from demonising water protesters and childishly blaming them for water shortages though. So there you have it. Domestic water charges would have prevented water shortages. How is it, then, that the United Kingdom faced the exact same water shortages following the exact same storm when they have had water charges in place since the 1980’s? This is the same TD who made the argument in 2015 on RTE’s Claire Byrne show that domestic water charges needed to implemented so that commercial water charges could be reduced for multinational corporations. In both instances, neither TD was asked for evidence, a core element of a journalist’s role. Instead they were given free rein to spout whatever pro-water charges diatribe they wanted without any request to justify their claims. The truth is that water usage increased during the extreme weather because people were confined to their homes for a number of days where they had to cook, clean, shower and flush toilets. This is sometimes referred to as living, with hygiene. 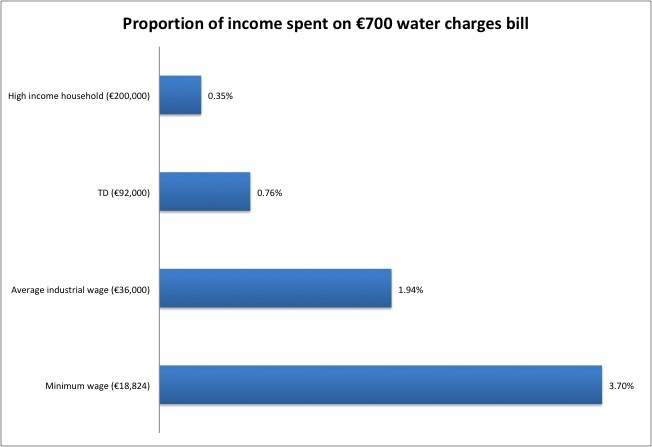 Incidentally, this only serves to prove Right2Water’s argument that those who would have been impacted hardest by a metered water charging regime would be our poorest and most vulnerable citizens - pensioners, the underemployed, unemployed and the disabled - because they spend a disproportionate amount of time in their homes. The article rightly condemned the water crisis, but apportions blame in entirely the wrong direction. "There was a predictable response from the opposition – spend more money on the country’s water infrastructure. But some of the calls were coming from the very TDs who fought to abolish water charges. That meant Irish Water lost €239 million which was being billed to customers,” said the editorial. So the Sunday Business Post is still under the illusion that every penny from domestic water charges would have been spent fixing leaks? Can the editor explain how Irish Water were going to pay for the metering of households which was to cost more than €800 million? What about operating the Abtran call centre which cost €9.2 million in 2014; €30.2 million in 2015; €21.2 million in 2016 and €15.2 million in 2017 – a total of €75.8 million? In fact, an answer to a Parliamentary Question asked by Joan Collins TD states: “The reduction in costs paid to Abtran since 2016 is reflective of the suspension of domestic billing”. So you can thank water protesters that up to €30m is now going towards fixing leaks rather than on a call centre. Further costs for Irish Water included consultancy fees of more than €90 million, with ongoing operations consultancy costs of €7 million per year. The advertising costs for the firm were approximately €3 million per annum. The postage and billing system was costing €6 million per annum (not to mention the environmental damage of 6 million bills being printed and posted on an annual basis). The ongoing costs for the maintenance and replacement of meters is estimated to cost €50 million per year, but that would be quite conservative. "Not one penny of the money they’re demanding you pay will be used to run, or to upgrade, the water system. In fact, even if everyone paid their water bill, every penny of the money would be spent on the admin involved in issuing us with bills." But, why would anyone want to double the cost of water infrastructure? Especially economists who are supposed to understand these things. Notwithstanding the fact he has no evidence that householders were doing this, it was pointed out to him that leaving taps running doesn't work, and that perhaps an education campaign would be appropriate in that regard. Shortly after he was backed up by Stephen Kinsella, Senior Lecturer in Economics at the University of Limerick and columnist with the Sunday Business Post. Conservation: Domestic charges reduce consumption levels – when people have to pay for water, they use less. 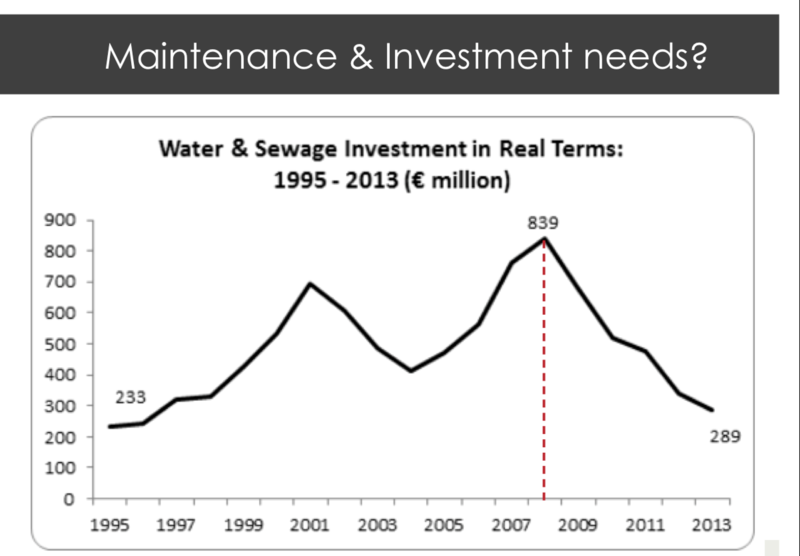 Investment: Water charges would provide an income stream enabling Irish Water to borrow and upgrade infrastructure. Let’s address both of these issues. 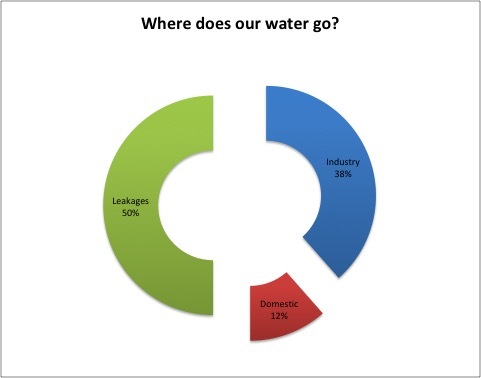 Firstly, let’s look at water usage. The government appointed “expert commission on water” produced a well-researched report which showed that Irish households use between 15-25% less water than UK households – where they have had domestic water charges since the 1980’s. Greek economist Yanis Varofaukis explained in his recent book that economists generally cannot comprehend a world outside of commodities. They know the price of everything, but the value of nothing. Nothing can exist outside the world of supply and demand and therefore they find it impossible to understand what they believe is irrational human behaviour. He uses blood donations as a way to illustrate his point. Countries who pay for blood donations have a lower uptake than countries who rely on unpaid donations. This is because when you commodify an item, it loses its goodwill factor. A donor who was willing to donate blood on the basis that they wanted to help someone in need may feel cheapened by the process of being paid, and change their mind about donating. Water is no different. When you introduce a cost, in many instances, high income households in particular will use more of it stating: “I’m paying for it anyway, so I can use as much as I want,” as they fill up their swimming pool for the second time in a week. This is important to understand because high income households will never worry about a €700 bill coming through their door. On the other hand, a householder on the minimum wage will spend a much higher proportion of their income on the same bill – and again, as stated throughout the Right2Water campaign, domestic water charges are an attack on the standard of living for the poorest in our society. And before anyone says: “Oh, but there’d be allowances and exemptions,” we all know how that worked out with bin charges. Throughout the recent “water crisis” we were told to conserve water because it is a “scarce resource”, and it is. Globally water is becoming more scare as populations increase and industry uses it. But throughout all of the lectures by TD’s, the media and economists, not once has any of them called for the real polluters and users of our water to pay appropriately for their usage. Most domestic households use water to cook and clean. Most businesses use water in the pursuit of profit. This is an important distinction, yet it is businesses that use most of our water, but for some, householders are expected to pay the bulk of the bills. 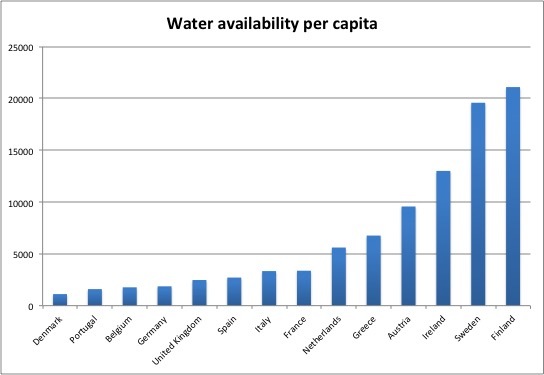 According to a 2005 joint report entitled The Wealth of the Poor – Managing Ecosystems to Fight Poverty, produced by the United Nations Development Programme and the World Bank among others, Ireland has 13,003 m3 of “Actual Renewable Water Resources” available per capita. Compare this with our closest neighbours in the UK where they have 2,474 m3 per capita, or Germany 1,866. We are a water rich country, and again, as the expert water commission stated, we have five times more water available to us than France and fifty times more water available than Israel. 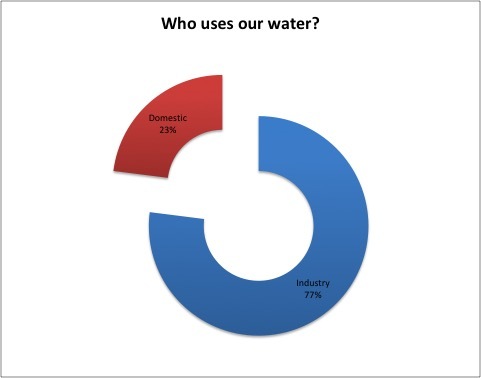 But here’s the thing…according to the same report, industry uses 77 percent of our water while domestic households use only 23 percent. So why such an emphasis on households reducing consumption? Irish Water’s own estimates, which they have admitted need to be reduced, are that domestic water charges could reduce household consumption by 6 percent. Do the maths - 6% of 23% is 1.38%. 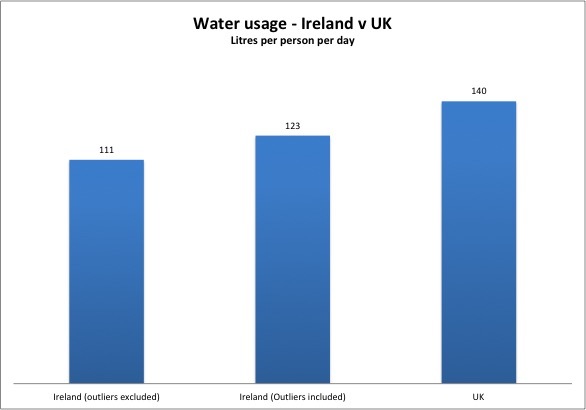 So, pro-domestic water charges campaigners are arguing to double the cost of our water infrastructure – by introducing meters, call centres, billing systems, advertising, etc – so that we can reduce consumption by a maximum level of 1.38 percent? And that’s before we take into account that 50 percent of all water is leaked before it gets to the household meaning you can reduce the 1.38 percent by half. It hardly seems worth it. Try looking at this chart and asking yourself, if you had €2 billion to spare, where would you target expenditure to reduce wastage of water? Would you fix leaks, target commercial water charges or implement a highly expensive domestic metering programme? In fairness to the expert water commission, they echoed Right2Water’s calls for abstraction charges. In Ireland. If you weren’t already aware, companies like Britvic (Ballygowan), Glenpatrick Spring and Kerry Spring can extract unlimited amounts of water from our wells, bottle that water, and then sell for a profit without paying a single cent in fees. But what about commercial water charges? Well, the expert water commission highlighted a serious flaw in the system. They say that half of all businesses are refusing to pay their water bills. In fact, Irish Water inherited €100 million of debt in relation to unpaid commercial water charges while a further €50 million of debt was written off. Taking account of the figures published for 2015, where Irish Water’s financial statement said that non-domestic revenue brought in €219,872. It’s interesting that this is significantly down on the previous year, before domestic water charges had been implemented, where non-domestic charges raised €248,066. It’s not possible that Alan Farrell’s announcement on RTE that domestic charges were being brought in to give corporations a cut in their rates was true, is it? Either way, we can extrapolate that if there is a 50 percent non-payment rate in commercial water charges, and Irish Water took in approximately €220,000 in 2015, then if they pursue the commercial non-payers, we could raise revenue of more than €400,000 per annum from this source. This, combined with abstraction charges, exploration of increased commercial charges and ring-fencing revenue from the government subsidy (as suggested by the expert commission on water) would provide the necessary income stream for the badly needed investment cited by so many of the pro-water charges lobby. The argument goes – if we have domestic water charges it will be a guaranteed revenue stream that Irish Water can then use to borrow from the markets. This will then help us to fund the upgrading of our antiquated water infrastructure. If there’s one thing everyone agrees, it’s that water needs to be paid for and our current infrastructure desperately needs upgrading. We lose an enormous amount of water to leaks. In some parts of the country, like Dublin, up to 57 percent of all water is leaked through holes in the pipes. This is a scandal. So who is responsible? The government are. Between 2008 and 2013 the Irish government cut water funding by 65 percent. As recently as 2015, the Irish government of Fine Gael and Labour cut the government subvention to Irish Water by almost €40 million, while allowing commercial companies a reduction of €30 million. The argument that we need domestic water charges in order to raise funds so we can borrow is a problem for a number of reasons. 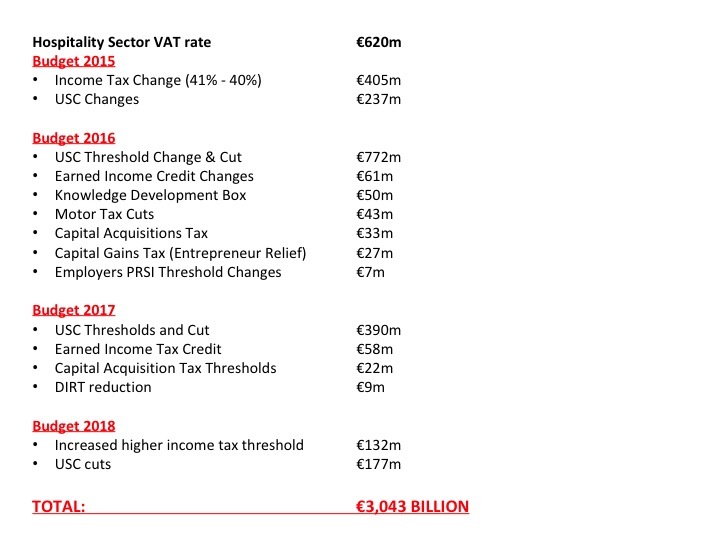 Firstly, we have given more than €3 billion in tax cuts in recent years, predominantly aimed at the highest earners and businesses. This could have done an awful lot to upgrade our water infrastructure. Secondly, our government can borrow at record low rates at this moment in time, yet Irish Water would have to borrow at a much higher interest rate off the markets. I’m reminded of a podcast where renowned economist Ann Petifor illustrated the idiocy in this argument. She pointed out that hospital trusts in the UK are currently borrowing at interest rates of up to 15 percent, yet the UK government can borrow at 0.35 percent. So why doesn’t the government borrow and upgrade the hospitals? The same can be said of our water infrastructure. Having said that, why would you take out a credit union loan with interest rates if you have the savings to buy the item outright? They could, if the will was there, stop giving tax cuts to the wealthy and fix the infrastructure immediately. But that doesn’t help them financialise water. The argument made by Stephen Kinsella on his Twitter account is that water issues will be fixed quicker in the UK due to their investment model they have. What he didn’t realise is that on average, every household in the UK is paying £80 per year to service debt and dividends incurred by water companies. That’s 27 percent of all water bills that is lost to the system because of borrowing and privatisation – which, no matter what anyone tells you, is the end outcome for the imposition of water charges. Everyone will tell you that there is no privatisation agenda when it comes to water, but very few are campaigning or arguing in favour of a referendum on water ownership. Fine Gael, Fianna Fail and Labour will say they are opposed to water being privatised, but not enough to give us a referendum so we can prevent future privatisation. These are the same political parties who have collectively supported privatisation of Aer Lingus, Bord Gais, Eircom, Irish Sugar, Irish Life Assurance, Irish Steel, British and Irish Steam Packet Company, Irish Fertiliser Industries, ACC Bank, ICC Bank, Cablelink, Great Southern Hotels, as well as opening up vital public services to privatised competition including - transport, electricity, postal services, healthcare, education. Why would anyone question their honesty when they say they don’t want a privatised water industry? But even if all those political parties were being honest, there is another threat. “So what happens when we get another bailout in the not so distant future and the EU, ECB and IMF (and others) demand privatisation – like, say, Portugal, Greece or Italy?" The only reason Ireland was not forced to privatise our water during our bailout 8 years ago was because there were no meters and therefore no revenue stream, so no ability to make profits from our water. The first step towards changing that is metered water charges. So in 5 or 10 or 20 years time, it is possible outside organisation will force Ireland to sell off its water if it is not enshrined in the constitution. Don’t believe us, look at these two quotes from Credit Suisse. 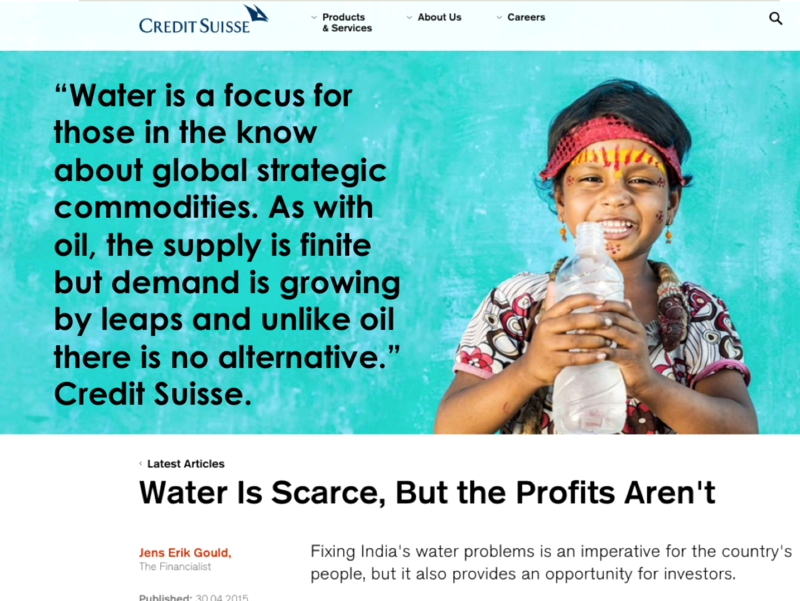 There is no question, the financial services world is after our water. One of the reasons is that water is now three times more profitable than oil or gas in the UK. But what happens when you privatise water? 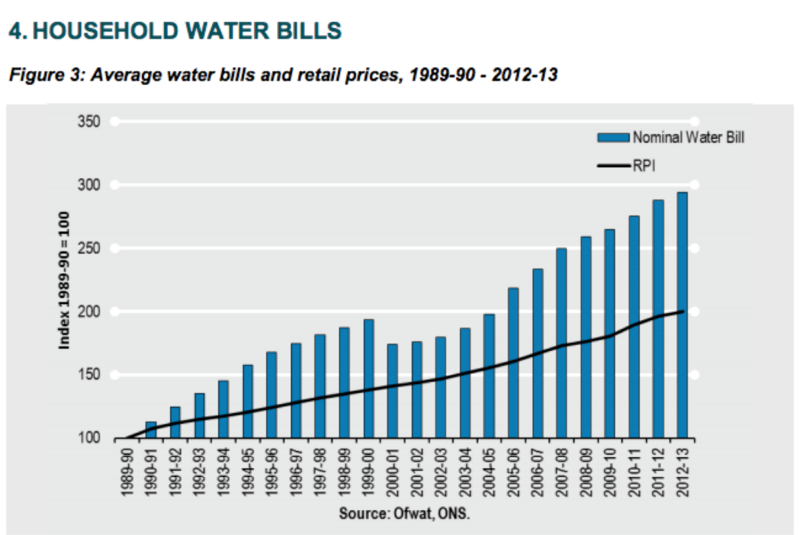 Here’s a chart of how water prices increased in the UK compared to the average retail prices. Water has increased at double the rate. And the end result? Water poverty in the UK is now at 23.6 percent compared to 0 percent in Ireland. This is something we should be proud of. 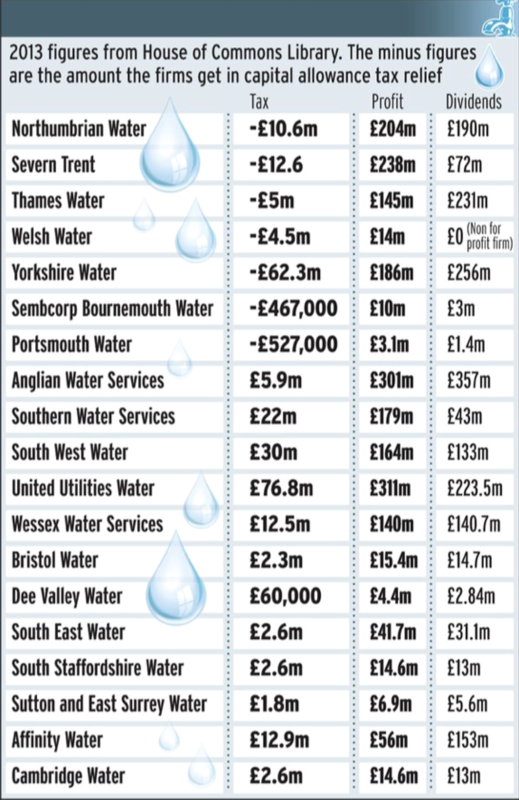 Water companies in the UK have been criticised for their refusal to pay taxes. In 2013 in Britain, private water companies made profits of €2.81 billion, paid shareholders €2.55 billion, while only paying €101 million in taxes. Seven companies paid no taxes whatsoever. Thames Water, one of the largest in the UK, paid an effective corporation tax rate of 0.128% between 2008 – 2013. Not one media outlet interviewed Maude Barlow or covered the two speeches she made. Maude, if you don’t know, has written four books on water and was an advisor to the UN on water, along with dozens of other accolades. She is widely recognised as one of he worlds leading experts on water. Her statement simply didn’t fit the medias and right-wing agenda. "It is clear that the best method of securing access to water, and securing funds for infrastructural investment, is through general taxation. "The European Water Movement views the struggle of the Irish people to abolish water charges, and to secure a referendum enshrining public ownership of Ireland's water system, as yet more evidence of a real European people's movement to democratise water management." Even when the government’s own "expert commission on water” published the facts and figures behind our water usage - supporting what Right2Water Ireland has been saying for years – the line from the media was that we need water charges. Don’t let ill informed 'know-it-all' economists or the media spin their ignorance or their propagenda in pursuit of a neo-liberal policy of water commodification and financialisation. They did it in housing, health, education and other sectors of our society with devastating impacts, let’s keep our water out of their ideology and their ideology out of our water, and let's not make the mistakes that the rest of the world has already made - and is paying for now. Oh, and if you protested against the introduction of water charges, you are a hero, and you should be proud. Do not let them blame you for water shortages, that responsibility is entirely down to those who refuse to tackle the real wasters (commercial enterprises) and those who cut funding for water infrastructure (Fianna Fail, Fine Gael, Labour and the Green Party). Now, can we please stop the waste of money on meters, advertising, call centres, consultants, etc, and use the savings to fix the damn pipes? And finally, sign the petition and call on your local TD's to support a referendum on water ownership. For more, read "Why can't we have an mature debate about water" published by Right2Water more than a year ago.